Take on the life of a Native American, living in the undiscovered West. Click here to play! You'll learn from the land and listen to the animals while catching dreams and a few dollars. Let the Chief show you the ways of the tribe. He only appears on reels 1 and 5 and substitutes for all symbols excluding the scatters. The Chief doubles all prizes when he appears in a winning combination. 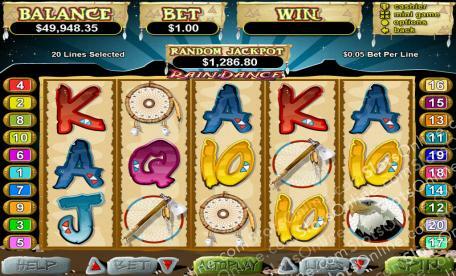 Two to five teepees will pay up to 2500 times your original line wager. Five Bald Eagles will pay out 1000 times your bet. Keep an eye out for dream catchers and drums as these will both help you in catching your fortune. When you spin two to five Howling Wolves anywhere on the board, you'll receive up to 100 times your total bet. The Wolves also trigger a feature that can award you with 10,15 or 100 free games! Live the life of a noble Native American and you may find yourself sitting pretty on a mountain of cash. The Howling Wolf acts as a scatter symbol. Two or more of these will multiply your total bet respectively. When two or more scatters appear anywhere on the board, a respin feature is activated. The reels with scatters on them are held while the other reels respin once. 3, 4 or 5 scatters after a respin will trigger a feature that can award you with up to 100 free games! The noble Chief dressed in his cerimonial head dress will substitute for all other symbols excluding the scatters. He only appears on reels 1 and 5 and will double the prize when appearing in a winning combination.